EXETER – If you are a young girl looking to earn a scholarship for college and find a way to both support and be more involved in your community, you might be the next Miss Exeter. The Miss Exeter program is a way for young women to represent their community and a local business at events throughout the year, most notably the annual Fall Festival held each October but also including the chamber’s annual banquet, mixers, Christmas Open House and the Full Bloom Garden Walk. During the program, each candidate is sponsored by a local business to introduce our youth to the business leaders of the community. 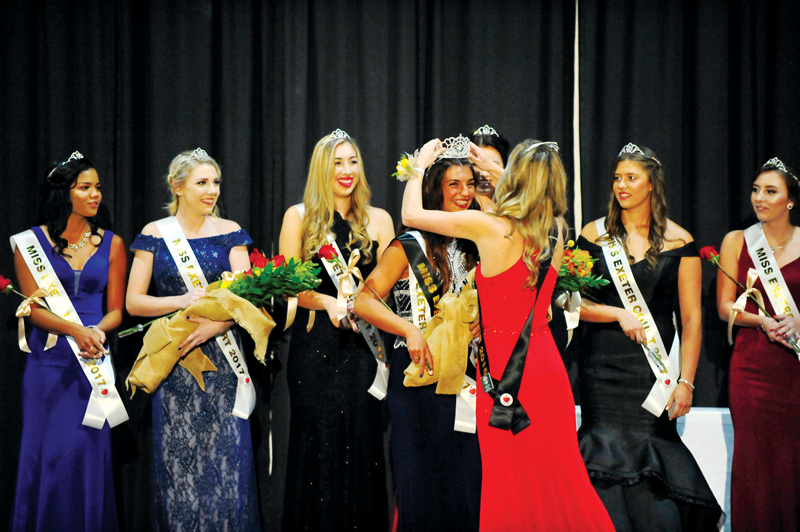 This year’s Miss Exeter will preside over the 105th annual Fall Festival from Oct. 8 to 13. The Exeter Chamber of Commerce will be holding a “Miss Exeter Information Only” for girls learning more about the program at 5:30 p.m. on Wednesday, Aug. 8 at the chamber office, 101 W. Pine St. in Exeter. This meeting is for questions and answers about how the program works, what the required commitments are and how to enter. We encourage potential candidates and a parent to attend. For more information, call the chamber at 559-592-2919. The deadline to apply for the Miss Exeter personal development and scholarship program is 5:30 p.m. on Tuesday, Aug. 14. Applications must include a candidate entry form, personal essay, photo and candidate and parent agreements. Candidates must live within the boundaries of the Exeter Union High School District and be enrolled in their junior or senior year of high school with an accumulative GPA higher than 2.5 to qualify. The chamber will accept up to 16 candidates up to the application deadline. Raffle ticket sales for the chamber of commerce. In addition to being crowned at the dinner, Miss Exeter will receive a $1,000 scholarship. Miss Exeter and her court will all receive gift packets with items donated by local merchants and businesses as well as a lifetime of memories. The chamber is also seeking sponsors for each candidate. Sponsors must provide information regarding their business. Interested candidates and sponsors should call the chamber office at 559-592-2919 for questions. Applications can be picked up at the chamber office, 101 W. Pine St. in Exeter or by e-mailing chamber@exeterchamber.com.